Astronics Corporation (NASDAQ: ATRO), a leading provider of advanced technologies for the global aerospace, defense, and semiconductor industries, announced today that its wholly owned subsidiary, Astronics Advanced Electronic Systems (AES), was recently selected by six major North American airlines to install industry-leading EmPOWER® in-seat power systems on up to 1,400 narrow-body and regional jet aircraft. Astronics AES will equip the airplanes with 110VAC and high output USB power for every passenger from "nose to tail," including the cabin crew stations. Line-fit and retrofit installations will occur from early 2018 through 2023. Peter J. Gundermann, President of Astronics Corporation, noted, "Being selected for these significant fleet upgrades further solidifies our leading global market position for passenger power on commercial aircraft and is a strong indication of the increasing trend for airlines to provide power for their passengers on narrow-body and regional aircraft. Carriers worldwide are responding to passenger requests for power at the seat so they can use their personal electronic devices to fully enjoy the streamed in-flight entertainment and upgraded connectivity systems provided by the airlines, while remaining fully charged when they land." Statistics show that 97% of passengers travel with personal electronic devices, and a large percentage carry more than one. For over 20 years, Astronics AES has supplied intelligent power management systems for airline passengers' benefits. 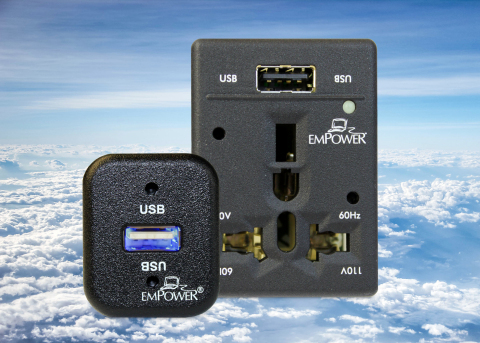 The EmPOWER system is currently in service with over 230 airline and OEM customers with over one million power outlets installed. Learn more about EmPOWER in-seat power solutions at Astronics.com. This news release contains forward-looking statements as defined by the Securities Exchange Act of 1934. One can identify these forward-looking statements by the use of the words "expect," "anticipate," "plan," "may," "will," "estimate" or other similar expressions. Because such statements apply to future events, they are subject to risks and uncertainties that could cause actual results to differ materially from those contemplated by the statements. Important factors that could cause actual results to differ materially include the progress of customer fleet upgrade programs, the state of the aerospace and defense industries, the market acceptance of newly developed products, internal production capabilities, the timing of orders received, the status of customer certification processes, the demand for and market acceptance of new or existing aircraft which contain the Company's products, customer preferences, and other factors which are described in filings by Astronics with the Securities and Exchange Commission. The Company assumes no obligation to update forward-looking information in this news release whether to reflect changed assumptions, the occurrence of unanticipated events or changes in future operating results, financial conditions or prospects, or otherwise.